We are in love. No, not with our husbands (well yes we are but let's forget about that for a second); but with a blanket. This, however, is not just an ordinary blanket. Oh no, this is a warm, embracing, soft fleece blanket with arms, and wait for it...speakers in a hood. 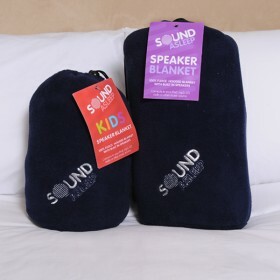 The Sound Asleep Speaker Blanket is a god-send in Britain's current big freeze. The removable speakers can connect via a wire to ipods, televisions and radios. There's nothing better than cuddling up with it and listening to an audiobook- trust us; we've been doing it all week! Available in an Adult & Child size for £15 from www.soundasleeppillow.co.uk.